Form 1767. 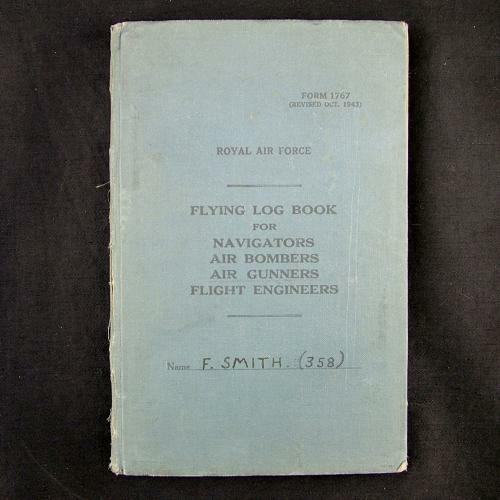 Flying log book for navigators, air bombers, air gunners and flight engineers. Named to Flight Sergeant J. Smith and covers the period from April 1944 to October 1946. It begins with training exercises on Avro Ansons and is stamped for No.11 Air Gunnery School (Andreas, Isle of Man). Tarelton is described as 'above average and will make an able air gunner'. More bombing, air to air firing training and fighter affiliation flights follow on Whitley aircraft at No.10 OTU, RAF Abingdon and Stanton-Harbourt. In September 1944 he goes to 1658 Heavy Conversion unit at Riccall (Marston Moor nr. York) on Halifax bombers until posting to 640 Squadron, part of No.4 Group Bomber Command at Leconfield, East Riding of Yorkshire, in October 1944. He then flew a full tour operational sorties on Halifax bombers with night and daylight raids to various targets in Holland and Germany. The sorties are very well and neatly written with detail of searchlights and flak encountered etc. For example, Dusselforf 'a/c hit by flak and coned by searchlights'; Duisburg 'attacked by ME109, a/c hit by flak'; Essen 'very heavy flak, a/c hit by flak - aircraft scrapped - over 200 holes'; Hannover; Saarbrucken; Witten 'very heavy flak, searchlights numerous' etc. In October 1946 Smith is in Egypt flying as a passenger in a BOAC Sunderland flying boat from Cairo to Khartoum after which the log ends. It is signed off throughout by Smith and his commanding officer. There is also a good crew photograph glued to the inner rear cover. Each of the crew is named and their number of 'Ops' noted. The log itself is in good used condition bar usual wear and tear. A very good well written late war log. Stock code P22743.